Looking for a new job can be either a frustrating experience or an exciting change. Many patrons use the library computers to access job applications or search for a new career. The reference staff is available to help those who are searching for jobs, but there are also many online resources that can answer simple questions and help with the application process. The Career Transitions website is a useful and powerful resource in helping to find a new career. To visit this website, go to www.wcpltn.org, move the mouse over eLibrary (on the left side of the page) and a drop down menu will appear. Click on Databases by Title and then select C-D. From there, click on Career Transitions, which is at the top. Here you can create an account that will save all of your information, but before doing that, it might be best to click on Take a tour of Career Transitions at the top right of the page. Taking the tour will walk you through the processes of searching for jobs, writing a resume, writing a cover letter, tips and advice on interviewing, and also includes a simulated interview. If you are looking to start a new career and not sure what to look for, the next section provides an area to assess your career interests. After determining your interests and expertise, you can browse career paths and get an idea of what type of salary to expect with your particular experience and training. Following this section, the tour continues with an area on discovering a new career. In this section, you can assess your career interests by taking a short survey. After deciding your areas of interest, you may browse career paths, salary and growth rates based on your selections or you can match your work experience to a new career. Finally, there is an area to search for schools and programs within a specific geographic area. Simply type in a job or career title (such as Electrician), select the distance you wish to search with your zip code or state and click the green Search button. If there are any schools, programs or courses within the area that you selected, this should produce a list of those results. Many new job seekers, or those returning to the work force, have questions regarding resumes. On the Home page, click on Write a Resume. Here, you can write a professional resume by simply filling in data about yourself and your work experience. Before beginning to create a resume, it may be helpful to gather all of the necessary data, such as name and contact information regarding previous employers, education, and references. Start with your contact info. Type in your personal data and click save. If everything is correct, click the green “Go to next Section” button. Follow the steps and if at any time that you may have a question, click on “What Can I Do Here?” at the top right of the page. This area may answer many common questions regarding building a resume. There are also many helpful articles linked on this page in reference to writing a cover letter, uploading your resume to the web, and information on professional portfolios. Many job seekers ask whether or not they need a cover letter when applying for a job. If the job application does not specifically ask for a cover letter, odds are it is not a requirement. However, including a cover letter can only help your chances of being considered for the position. Click on “Write A Cover Letter” (next to “Write A Resume”). The process is very similar to that of writing a resume using the Career Transitions website. There is also a link to samples of cover letters if you need some help or ideas. The Interview Simulation tab is a great way to prepare for the experience of an actual job interview. Clicking on this tab will first give you an overview of the simulation. Once beginning, users will choose a profile based on the individual’s personal level of experience. Then you will learn about the fictitious “company,” the open position and your profile. Based on this information, you will be asked questions regarding the job opening and your experience. You can choose whether to listen to audio or read the questions. After the questions are presented, three possible responses are given. You, as the interviewee, are to choose the best and most appropriate response. After responding to all of the questions, the simulation interviewer decides whether or not to conduct a second interview and feedback is offered regarding your responses. With these simple tools on the Career Transitions website, you can create professional resumes, cover letters, gain valuable interview experience and will soon be on your way to an exciting new career. Visit www.wcpltn.org to get started. The world is shrinking. Is Earth imploding? Have we taken so many natural resources out of the ground that the planet is actually becoming smaller? Not likely, but as global communication continues to advance; we are more connected than ever before in human history. Travelling across the Atlantic was once a dangerous trip that took months in a creaking wooden ship. Now, travelers can safely fly across the pond in under ten hours. Information can be sent around the world instantaneous by way of fax, email and cellular telephones. Fifty years ago, the chance that a child born in Appalachia would ever come in contact with someone from Southeast Asia or Latin America before leaving the region after adulthood was slim. In today’s world, because of various push/pull factors and globalization, that likelihood is high. We are in an age where it is increasingly important to understand the diverse cultures of the world as we are becoming progressively more linked. Information about the diversity of the cultural landscape was certainly available fifty years ago, but it was required that one go to a library to access the data in print form. Today, scores of data is accessible from anywhere at the click of a mouse button or tap of an icon. While there are countless websites and databases to choose from, A to Z World Culture provides an excellent resource for students who are doing a research project or anyone who is simply inquisitive about geography and world culture. The home page of A to Z World Culture has a simple, user-friendly design that allows visitors to easily locate information, regardless of age or computer skills. Either click on a country on the interactive world map or choose one from the scrolling menu. After choosing a country, users are shown the “Cultural Overview” of that country, which includes images showing the global location, the country’s political flag and pictures of people or landscape. Here, readers will also find written information on the cultural diversity, religion, stereotypes and popular culture of the country. Much more detailed information is available within the menu on the left. For example, clicking on “Maps” gives users a list of seven thematic maps that are available to download as PDFs. Among the downloadable maps are Political and Provincial maps (showing place names and boundaries), Physical and Natural Earth maps (showing natural features and topography), Population, Precipitation and Temperature. In addition to the thematic maps, there are also two useful blank outline maps, which are often helpful in learning location and preparing for a test or quiz. The Demographics tab under Country Profile is a valuable resource for population data. This page shows the total population for the selected country, the age structure, life expectancy, birth, death and migration rates and the population of major cities. Most of the data is relatively current, with estimates from at least the last year or two. This is useful information and an easy means for acquiring demographic data for comparative or survey purposes. Exploring the other tabs reveal general geographic information about the selected country such as Climate, Culture, Education, History, Language, Music and National Symbols, just to name a few. Clicking on the Country Profile tab is a good place to start. Here, users can learn about the demographics of the country, its economy and government, and its current leaders. For teachers, the Lesson Plan tab provides valuable resources for introducing place-specific geographic issues and topics to students in grades 7 – 12. Some could also be used in the college classroom for introductory social science courses. Most of these lessons involve role playing that allows students to learn interactively. All lesson plans are available to download as either a Microsoft Word document or as a PDF. Finally, if you are using any of this information in a paper or project, you will need to cite your sources. A to Z World Culture has made this easy by providing a link that generates Chicago Manual of Style, MLA and APA citations for the A to Z World Culture website. Additionally, there is a “Print this Document” button that opens the document for printing. As our world becomes smaller and more global communication barriers are permeated, we are experiencing less friction of distance and an increase in space-time compression. Resources like A to Z World Culture are powerful tools in bridging the cultural divisions that we more frequently encounter. In today’s global landscape, understanding cultures other than one’s own is essential in defeating xenophobia, increasing our knowledge and being successful in the new global economy. Visit www.atozworlculture.com and pick your destination. In our everyday, technology filled lives; it is easy to forget that the earth is dynamic. Our planet is constantly changing, whether we realize it or not. The landforms that we take for granted are in many cases the result of earth’s violent and relentless activity that has persisted for billions of years. This third planet from the sun is our home, but Earth does not care about us. Nature is not required to make sense nor consider human existence regarding its activity. What seems static from a human perspective is in a constant state of movement. Natural disasters often remind us that Mother Nature is more powerful than humans and she must be respected. Tectonic activity, such as volcanic eruptions are illustrations of Earth’s volatility. Though there have been more recent blasts in modern times, none have been more deadly than the eruption of Krakatoa on August 26, 1883. Krakatoa (or Krakatau) is a small island located between Java and Sumatra in the Indonesian Island Arc. The island is only about 3 miles wide and 5 miles long. These islands and the volcanic activity in the region is the result of tectonic movement below the sea floor. The Indo-Australian plate is subducted under the Eurasian and Pacific plates as it moves slowly northward toward the Asian mainland. 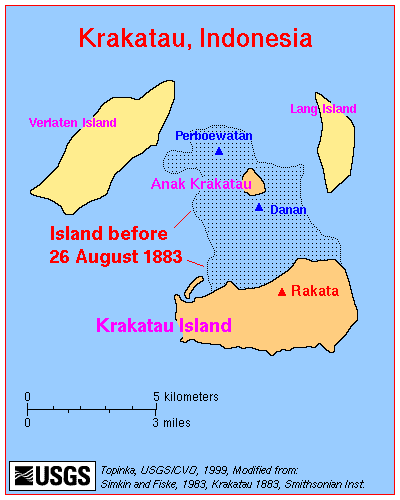 When Krakatoa erupted in August of 1883, an estimated 36,000 people were killed. Many perished due to the eruption, but many more died after the resulting tsunami following the collapse of the volcano into the caldera below. With our advanced modern technology, we are able to detect natural hazards like severe weather and also monitor earth’s internal movement. For example, in 1980, geologists were able to detect seismic activity and knew that Mount St. Helens would erupt soon, saving the lives of many. The brave Krakatoans (10 points if you caught the Seinfeld reference there) had no warning system or advanced notice. Before nature was understood at the level it is today, it was more respected and spawned many legends and folktales of angry gods and evil spirits. 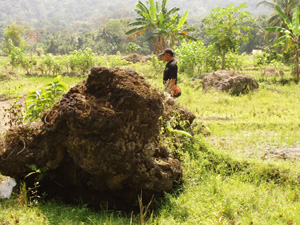 Those closest to the volcano in western Java and Sumatra were victims of the volcanic debris and hot gases from the blast. Countless thousands more were killed by the 120 foot high wall of water from the following tsunamis. After the initial eruption on August 26, a cloud of gas and debris was sent some 15 miles into the atmosphere and it is believed that debris from this eruption clogged the neck of the volcanic cone, allowing pressure to build inside the magma chamber. The next morning, four massive explosions were heard as far away as Perth, Australia (about 2800 miles) and much of the island collapsed into the caldera. According to the Volcanic Explosion Index (VEI), the eruption of Krakatoa is given a rating of 6, which is comparative to the explosive force of 200 megatons of Trinitrotoluene (TNT). The eruption of Mount St. Helens in 1980 had a VEI rating of 5. 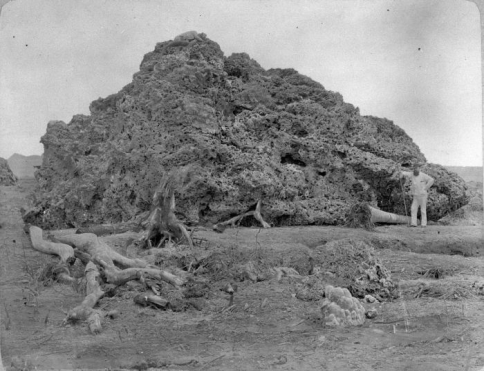 Coral block thrown onto the shore of Java after the Krakatau eruption of 1883. Picture taken in 1885. Just a few months prior to the eruption in May of 1883, the captain of a German warship reported a cloud of ash over Krakatoa that he estimated to be over 6 miles high. Other vessels in the area reported seeing similar sites and heard explosions. Inhabitants of the neighboring islands celebrated and held festivals in honor of the display of lights in the night sky. The celebrations would end tragically with the eruption and ensuing tsunami on August 27. The first explosion ruptured the magma chamber, sea water rushed in causing the water to flash-boil. The force of this phenomenon created a steam-generated explosion that propelled pyroclastic materials over 25 miles at speeds of over 60 mph. The eruption sent about 11 cubic miles of volcanic debris in the lower atmosphere that darkened the skies for nearly 300 miles from the volcano. 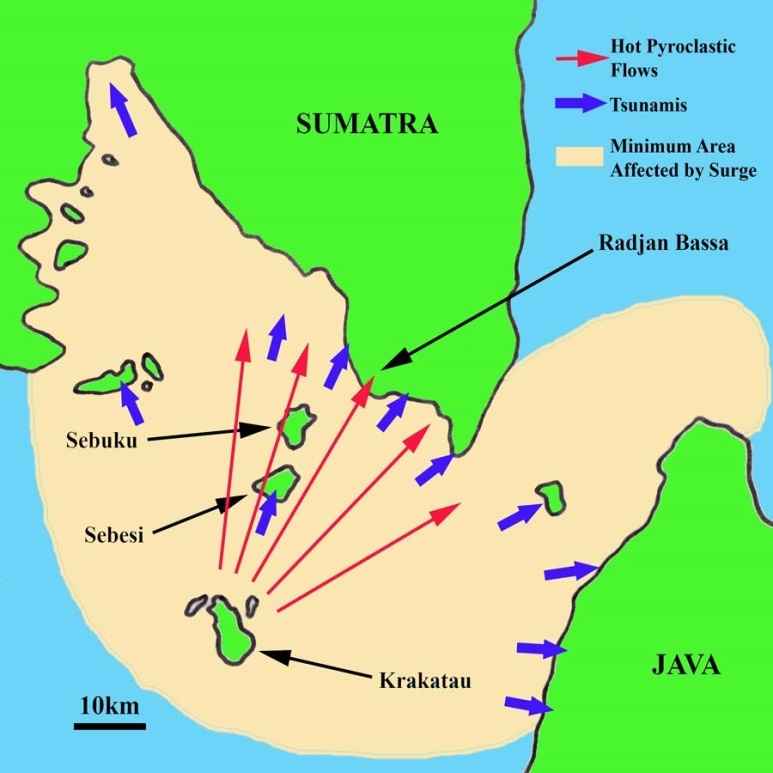 The effects of the eruption of Krakatoa were not only felt in the immediate area of the volcano. Because of the debris in the atmosphere, Europe and the United States experienced unusually brilliant sunsets and for the next five years, the average global temperatures would be about 1.2 F degrees cooler. Krakatoa was not the largest eruption in the modern era, but it was certainly responsible for the largest loss of life. Could an eruption of this magnitude happen again? Absolutely. Do we know where or when? Nope. But be assured that the U.S. Geological Survey has its eye on many locations. Nevertheless, there is nothing that we can do about an eruption other than be prepared. So stop worrying and enjoy this beautiful day. Earth always wins in the end. Most true Seinfeld fans will remember the episode called “the Library” way back in 1991. The first scene opens with Jerry in his apartment on the telephone. JERRY: Let me speak with the head librarian. …Because it’s absurd. An overdue book from 1971? … This is a joke right? What are you? From a radio station? JERRY: Ya’ got me I fell for it. Alright, OK I can be down there in like a half hour. Bye. JERRY: This you’re not goin’ to believe. The New York Public Library says that I took out Tropic of Cancer in 1971 and never returned it. KRAMER: Do you know how much that comes to? That’s a nickel a day for 20 years. It’s going to be $50,000. JERRY: It doesn’t work like that. KRAMER: If it’s a dime a day it could be $100,000. Jerry knows that he returned the book. Turns out he didn’t. Without giving away the ending, he had given the book to George in the locker room during gym class. George dropped it while suffering an atomic wedgie. Just watch the show. It will change your life. The point here is that library books are often misplaced in obvious locations (such as in the car, under the couch, or next to the bed), but sometimes they are hiding in strange and unusual locales. If you received a notice and need to search for a missing book, here are some spots to explore from a list of actual places that people from all over the U.S. have found lost library books. My apologies in advance for the additional commentary. Prince Rogers Nelson died on April 21, 2016. He was 57 years old. That’s way too young. Prince was not only an icon and a musical legend, he was perhaps a “once in a generation” artist that was still relevant after almost 40 years in the business. This isn’t supposed to happen. Our heroes are not supposed to die. Ever. We forget that they are mortal. We forget that they were once little children who went to school, ate dinner, got in trouble, and got scared. They are different than us. They are supposed to be stronger, smarter, more creative and invincible. In so many ways, they are unintentional representations of us; of who we are, who we want to be and most often, who we once were. We try to look like them, try to act like them, and try to write or create like them. But we can’t. Because we are not them. We deify them because they are greater than us and without them; we would not be who we are. Prince stood up when he felt he was being taken advantage of by his record label, appearing in public with the word “slave” written on his face and changed his name to an unpronounceable symbol in protest. He stood for something, even if it was only the control of his art. I cannot think of a comparison today. So many artists are beholden to corporations and greed and will not risk alienating anyone for fear of losing money or endorsements. I miss those days when rock stars used to be dangerous and take risks. They didn’t care about money. They cared about art and what they believed in and were willing to risk everything for it. Songs like “Little Red Corvette,” “Purple Rain,” “I Would Die 4 U,” and let’s not forget “Darling Nikki” were the soundtrack to a very important time in my life. I am sure that anyone who was in high school in the 1980’s can relate Prince’s music to some time or someone in their adolescence. In those days we bought the record. We went out to hear music or waited for it on the radio. It wasn’t On Demand. It didn’t stream and it was worth far more than it is today. MTV was new. I didn’t have cable but my friends did and we watched videos after school and watching Prince crawl on the floor staring at me in the video for “When Doves Cry” creeped me out. I can still see the flashing, sequenced lights and mirror ball at the skating rink in my hometown whenever I hear “1999” (that year seemed to be so far away). The same goes for “Little Red Corvette” (and everyone knew someone who moved a little too fast). The intro chords to “Purple Rain” take me back in time too, but that album came out later. I was older and the lyrics meant something more to me. In the 1980s, guitars ruled the world and Prince’s guitar solo on “Let’s Go Crazy” was nothing short of inspirational. It demanded you pay attention. Even at the age I was then, I could hear Hendrix in Prince’s playing. Everyone knew this guy was special. And now he’s gone. I am so thankful that our time on this earth overlapped. His music was playing during so much of my youth and he continued to create innovative music with the recent albums “Art Official Age,” “Plectrumelectrum” and “HitnRun Phase One and Two.” He played one of the most memorable Super Bowl half time shows ever and performed an unexpected 8-minute medley on Saturday Night Live in 2014. On Saturday April 23, two days after he was found unresponsive at Paisley Park, SNL produced a special retrospective of Prince’s performances on the late night show. Hosted by a teary-eyed Jimmy Fallon, it featured not only his first appearance in 1981 but also his last, which had never been seen before, as he and his band 3rdeyegirl burned through an unrehearsed version of “Let’s Go Crazy” at the 40th anniversary after-party. Jimmy said that the “crowd parted as Prince floated to the stage in a cloud of purple” and then tore the house down. I watched the show in silence and for 90 minutes on Saturday night, Prince was still with us. As I mourn Prince’s passing I also lament the struggling condition of today’s music. Many of the people I talk with share the same belief that today’s music is in a sad state, which is one of the reasons why Prince’s death is so numbing to me. Prince never repeated himself. He moved forward. He was about the performance and always had something to prove. We argue about politics and religion but what brings us together? Music. The pure joy of music. We’re all in this together and music is one of the few things that can unite us. Prince saw the future. Now he’s in the past. But his music helped create our present. *Opinions expressed in this blog are solely those of the author and in no way reflect the philosophy or preferences of the Williamson County Public Library, its staff members, their families, friends, or pets. The band broke up in 1980 (well, took a vacation) and Frey and Henley each had successful solo careers, Henley’s being the most successful (which certainly prompted a song by Mojo Nixon called “Don Henley Must Die.” Written in jest, I’m sure, and perhaps distasteful to bring up at this time, I always thought it was funny: “He’s a tortured artist, Used to be in the Eagles, Now he whines, Like a wounded beagle.”). Of Glenn Frey’s solo hits, my two favorites were “Smuggler’s Blues” and “You Belong to the City.” “Smuggler’s Blues” from Frey’s solo album “The Allnighter,” was a cool little tune with a great, bluesy slide guitar part. The video for the song inspired an episode of Miami Vice, in which Glenn played the part of a drug smuggler. The B side of “Smuggler’s Blues” was the track “You Belong to the City,” written specifically for Miami Vice. Glenn played all of the instruments on the recording except the drum and saxophone track. The song has such a great street-like feel and the sax typifies the nighttime urban atmosphere. “You Belong to the City” peaked at number 2 on the Billboard Hot 100 and number 1 on Billboard Top Rock Tracks. I remember in high school, we used to sit around with acoustic guitars and sing “Seven Bridges Road” from the Eagles’ Live album. Like we could ever come close to that five part harmony, but it was fun. The song was written by Steve Young and was on his “Rock Salt and Nails” album in 1969. Young originally didn’t like the Eagles’ cover version but admitted that the more he heard it, the better it sounded. You can clearly hear Frey and Henley’s voices in the wall of vocal harmony on the Eagles Live album and without Randy Meisner’s tenor, it just would not have happened. Probably my favorite Eagles song sung by Glenn Frey is “New Kid in Town.” Eagle’s biographer Marc Eliot said it best when he wrote, “New Kid in Town” captures “a precise and spectacular moment immediately familiar to any guy who’s ever felt the pain, jealousy, insecurity, rage and heartbreak of the moment he discovers his girlfriend likes someone better and has moved on.” But for me, it was more about the chord changes and the structure of the song. It is so well written with a bit of a Spanish sound …and those major 7 chords, minor 7 chords, there’s a key change after the beautifully constructed bridge then another key change back to the original key of E after the last chorus. Who writes like that today? Honestly, plenty of people do, but you won’t hear it on the radio anymore. “New Kid in Town” peaked at number 1 on the Billboard Hot 100 chart in 1977. Glenn Frey was the epitome of the American dream. He was a Detroit rock fan who grabbed his guitar and headed for the coast, met some guys, did some drugs, wrote some songs and changed the world. And although he left the Motor City, he never forgot where he came from. Bob Seger said in an interview, “He was so much more than people knew he was … He would never fail to start with telling me how grateful he was that audiences were still there. He loved the band. He loved the fact he could keep doing this. And he kept doing this until six months before he died.” Glenn Frey is gone way too soon. Why do we mourn our rock stars more than other celebrities? Probably because of what they represent and how they and their music shaped our youth and our lives. True rock stars from Glenn Frey’s era were actually what the original moniker characterized. They didn’t care what you thought. They gave the middle finger to the man and conformed for no one. The writers of this timeless music seem invincible and when we lose one, it reminds us of our own mortality, both individually and as a group. So, thank you, Glenn Frey. The Eagles music was the soundtrack to so much of my life. And it’s the music, along with the somber reminder of impermanence and evanescence that makes me want to sit back with a beer and sing while I still can. Or better yet, put me on a highway, and show me a sign. And take it to the limit…one more time. On Sunday evening, January 10, 2016, David Bowie died at the age of 69. After the sudden death of Lemmy Kilmister of Motörhead and the passing of Natalie Cole, the music world has suffered the loss of yet another icon. As modern rock and roll ages as a genre, we will unfortunately see more influential artists disappear in the foreseeable future. Paul McCartney is 73, Robert Plant is 67, Bruce Springsteen is 66, the guys in Iron Maiden are in their late 50s (sans Nicko McBrain who is 63) and they are all still actively creating new music, but performing takes its toll on the body. Artists like these all seem larger than life. Even immortal. Aren’t they supposed to live forever? Anyway… Bowie had just put out a new album entitled “Blackstar,” his 25th studio album. I never realized it until now, but Bowie’s music has been present in my life for a very long time. Around the time I started playing guitar, I used to repeatedly listen to a crackly 45 of “Space Oddity.” (For those under age twenty-five, a 45 is…never mind. Go ask your parents.) I was in 8th grade when “Let’s Dance” and “China Girl” were in the Billboard top ten (yes, I’m that old). I bought the “Best of Bowie” two CD collection many years ago and have done an acoustic version of Ziggy Stardust at a few of my solo gigs. David Bowie had to have known the impact that his music and career had on the entertainment world, but some question whether or not he was aware of his own global reach. David Bowie was born David Robert Jones south of London, England on January 8, 1947. After several unsuccessful bands and musical endeavors in the 1960s, he would begin his solo career with his focus not only on music, but image as well. He changed his name to Bowie to avoid confusion with Davy Jones, the lead singer of the Monkees. The success of “Space Oddity” would drive Bowie’s career in the early 1970s and he would be a pioneer of the genre of “glam” rock. He and guitarist Marc Bolan are credited with inventing the genre. With the creation and huge success of the characters Ziggy Stardust and the Spiders from Mars in 1972, Bowie’s status as an influential rock icon was cemented, even if he didn’t record anything else. Coupled with his androgynous appearance and admitted bisexuality, David Bowie was unlike anything at the time. He greatly influenced bands like Mott the Hoople, Roxy Music, Sweet, and the New York Dolls, all known for an androgynous appearance that was directly related to Bowie. But it’s the music that is so important. Much of what he did in the 1970s still sounds fresh today, “The Man Who Sold the World,” “Changes,” “Rebel Rebel,” “Young Americans,” Suffragette City,” and “Heroes,” the first and last songs being covered by Nirvana and the Wallflowers, respectively. I could go into great detail about Bowie’s music, image and the impact of his artistic endeavors on the world, but this has been written at length by music writers much better than myself. To me, what is so significant about the loss of David Bowie is that he was an innovator; one that continued to reinvent himself and remained creative and original until the end. He was not only a musician; he was also an actor, artist and fashion icon. In a modern music world where conformity is the rule of the day and artistic development is rare, David Bowie would not have had a chance today. Bowie’s first records were not huge successes until “Space Oddity.” He began his career in 1962 but didn’t see real success until the early 1970s. Today, if an artist’s first album is not a blockbuster, he or she is done. No development. No second chance. That’s it. Without Bowie, there would be no Madonna, Lady Gaga, Marilyn Manson, Alice Cooper, Motley Crue, even Smashing Pumpkins… the list goes on. Bowie tested limits, broke barriers and invented original, unearthly characters. At the risk of sounding cynical, how many of today’s top artists will still be making critically acclaimed, innovative music into their 60s? How can you benefit from the Tennessee Electronic Library? Whether you are a student of any grade level, preparing for the ACT, SAT, GRE or GED, an undergraduate or graduate scholar, looking for a new career or are interested in researching your heritage, the Tennessee Electronic Library has something for you. The Tennessee Electronic Library (TEL) is an online library that provides everyone in the state with access to a vast selection of resources. These resources are available free of charge at any time, all you need is Internet access. Whether you are at home, in a computer lab or on your smart phone, a wealth of information is available to help with any of your research and data needs. TEL shortcuts will take you directly to resources for Homework, Research, Test Prep, Career Tools and Genealogy. For younger students, click on the link “TEL Kids Page” to access resources for grades K-5. If you have a school paper or project due, the Student Resources in Context will help provide primary source materials for many subjects. Within this area, there is a brand new “Research in Context” button that is designed specifically for middle school students. This link is an invaluable, easy to navigate tool for many projects with topics ranging from Cultures, Government, Science and History. Biography — Learn about the lives of Bill Gates, Duke Ellington, Edgar Allan Poe, LeBron James and Walt Whitman, just to name a few. Business and Economics — Here you will find a broad scope of information on everything from advertising and fashion to what made Facebook a global phenomenon. Geography — We live in an age of globalization where it is increasingly important that we know what is going on in the world. From Afghanistan to Zimbabwe, learn about current events and issues that are facing each country and how it can affect you. There are many links to NPR podcasts, videos and academic journals. Each link also provides maps and statistical data for each country, which includes individual states of the U.S.
Social Issues — This section provides links to diverse and important topics and current world events. There are many articles, audio recordings and interactive maps relating to an extensive list of social issues. The Tennessee Electronic Library also provides users with access to popular magazines, videos, ebooks, scholarly articles, newspapers, podcasts and much more through their Gale Power Search. TEL can also help with test preparation, starting at Grade 4 through college. Resources include information on ACT, SAT and Graduate School Entrance exams. Clicking on “ACT, SAT” will take you to the College Preparation Center where you will find practice tests, tutorials and other resources for college admissions. The “Graduate School Entrance Exams” link takes you to the College Center, where you can prepare for graduate school admission exams by reviewing math, reading, writing and science skills. There are also video tutorials on how to download and use an ebook, how to take a test, as well as resources in Spanish. Make the most of your experience and knowledge when looking for a new career by clicking on the Career Tools tab. Here, you will find powerful tools to organize job searches and match your expertise with new career opportunities. You will also find help to build your resume and write a cover letter. Find information on your heritage and family history through digitized census records starting in 1790. There is also a special link to Tennessee State Library and Archives, which is partnered with Ancestry.com. Here you will find free historic Tennessee information on births, deaths and tax records. These are just a few of the ways that the Tennessee Electronic Library can help you with many of your research and data needs. Visit TEL and explore!